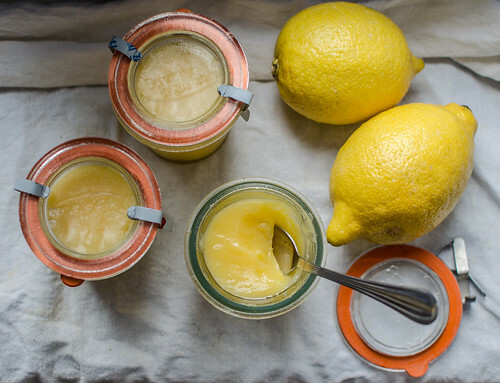 Home-made lemon curd is so quick and easy to do, and so delicious, that there’s no excuse for not making it when lemons are cheap and plentiful. Keep in the fridge and consume within a few weeks. This quantity makes about 2 jars. It can be done in the microwave, but I make it in a double boiler; it’s just as quick and you can see exactly when it’s ready. Have ready some clean, warm jars (I wash and dry them, then put them in the oven at 100C while I’m making the curd). Finely grate the lemon rind into a heatproof bowl. Squeeze the lemons. Beat the eggs, add the lemon juice to them, and strain them into the bowl with the zest. Add the sugar and the butter cut into small pieces. Place over a pan of simmering water and stir more or less constantly until it thickens and looks glossy. This will only take a few minutes. Do not overheat or the eggs will curdle. Remove from the heat and pour into jars. I want to make your lemon cheesecake but there’s no lemon curd in the shops. And that is often too sweet, isn’t it? I looked up another recipe in my books and it mentioned 45 mins stirring… Yours is quick and the flavour is divine. 45 minutes?? That’s ridiculous! I can’t imagine it taking that long. This recipe works well in the microwave too. I have just discovered a rather remarkable way of making lemon curd that involves boiling the egg mixture. I was nervous, but I tried it using the quantities above, and it worked! It’s even quicker than my normal method too. Well worth a try.